Pepakura Designer is a computer program that takes a 3D model and “unwraps” the surface onto a flat sheet. The 2D sheet creates little tabs, or flaps, and adds numbers to the flaps. You print out the sheet on paper, cut out the pieces, then match the numbers together and glue the tabs in place. Your flat paper transforms into a 3D object! 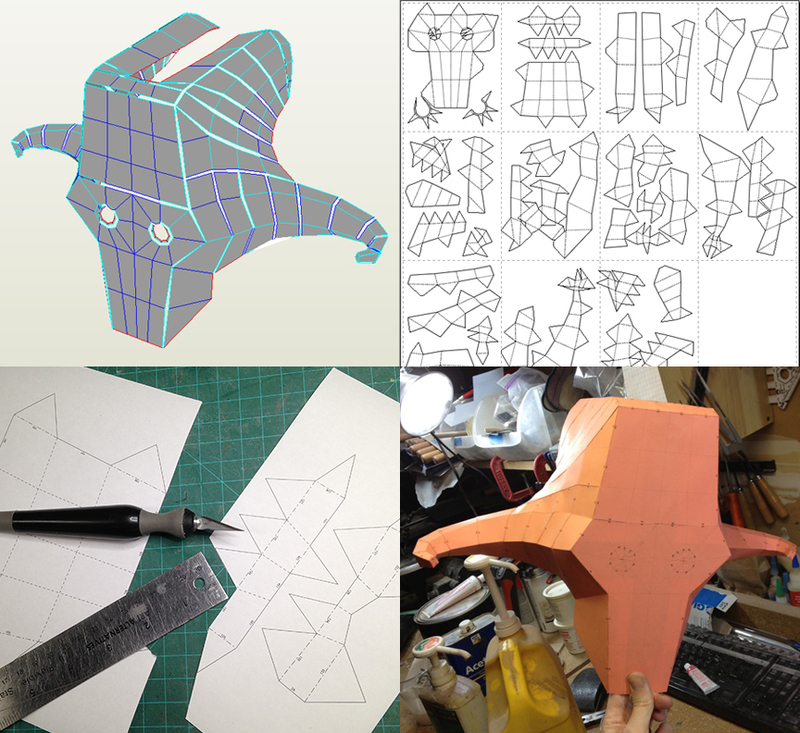 Check out the videos at the bottom of this article for some basics on Pepakura. Pepakura is a handy tool to add to your cosplay arsenal. I’ve used Pepakura in quite a few builds, like my Kaijudo Gauntlet Trophies, DotA 2 Juggernaut Mask, Constant C Helmet, and Skyrim Draugr Deathlords cosplays. It’s free to view and print files in Pepakura Viewer. You don’t need many tools. Just a printer, paper or cardstock, scissors, and glue. For more precise cuts, pick up an X-Acto knife and a metal ruler. You can quickly make a basic frame for a prop. Then, fiberglass and coat the piece in Bondo to smooth out the rough edges. Have to make a helmet with ear pucks? You can make your cosplay piece symmetrical with a Pepakura template. 3D Printing can be expensive, especially if you size the 3D print incorrectly and your mask ends up being too small! Test the size of a 3D print by printing out a Pepakura file and roughly piecing it together for scale reference. Common movie and video game characters probably have a Pepakura file already available to print. Search online for terms like “Iron Man Helmet Pepakura”. You can transfer your template to thick materials, like 6mm Craft Foam!